The Wine Valley Inn is located just one block off the two main streets of Solvang, (route 246 and Copenhagen Dr.) making it very easy to walk to patisseries, bakeries, chocolatiers, wine tasting rooms, bistros, restaurants, and independently owned shops specializing each in their own wares (hat shops, leather goods, Scandinavian emporiums, art glass, antiques, etc.). Take the time to notice the little details, such as replicas of the endangered Danish white storks on the roof tops, or the little statuettes placed around town (a replica of Copenhagen's little mermaid sits at the entrance to town). The Wine Valley Inn is pet friendly and there is ample FREE parking both in the front and back parking lots. High turn-over does not exist at the Wine Valley Inn. The previous manager of nearly 20 years recently retired and the assistant manager has stepped into place, having been with the Inn longer than the half decade plus that we’ve been visiting. Warm, kind, and lovely in nature, she continues the tradition of making each guests' stay as pleasant as possible. We particularly remember a moment when our photographer forgot his most prized lens on a table in the garden. Already at a winery on the other side of the range, realizing the mistake, we quickly called the Wine Valley Inn. We were immediately informed that one of the gardeners found it and brought it to the front desk. She had it waiting for us with a warm smile when we swung back to retrieve it. We also remember a nice gentleman on our first visit who brought us a much needed corkscrew – we hadn’t seen him since, but on our most recent visit, he took care of us again. When someone leaves the Wine Valley Inn, they often return. One can only speculate that they treat their people better than most, thereby having many return or just never leave. They also give the impression that they take great care in who they hire, as if being a good person is an aspect of the selection criteria: on a previous visit, we had excessive luggage (camera crew and a significant acquisition of local wines) and one of us was attempting to bring 4 suitcases up three stairs. A maid noticed the challenge and immediately rendered aid, hoisting all three remaining luggage up the steps with ease. The staff has a genuine sincerity often feigned at other establishments. After a day of fantastic wine tastings, we came home (that's what the Wine Valley is to us - home) to change for dinner. The lobby is always the regroup area when we stay here with friends. Prior to heading out for dinner, we met in the lobby, had some cheeses and a wine pairing and reminisced about the day....amongst friends, nothing can be more refreshing than discussing the day's shared adventures...and the lobby is always a place of fun and laughter. A gratuitous breakfast comes with each room and cottage. At first glance, it appears to be the standard fare often found in the back of a room of any morning business conference yet this would be a very false impression. Hot scrambled eggs, hash browns, local fresh Danish pasties, coffee, tea, fresh orange juice, fresh fruits, boxed cereals, yogurt, etc. are always available during the breakfast hours and amply replenished so as to never run out. The scrambled eggs are not that stuff that comes out of a milk carton but rather chef prepared, light, and fluffy. The pastries are fresh local pastries (something not to miss in Solvang – they take the art very seriously, such that even the King of Denmark has called Solvang “More Danish than Denmark.”), very light and flaky with an abundance of flavor! The orange juice could easily be freshly squeezed, we didn't ask but have no doubt. Take a seat facing the back windows and enjoy watching clouds drift across the valley in front of the mountains. The gardens form the central feature of the inn – all of the beautiful northern European designed cottages are at its periphery, forming the scene of a perfect impressionist painting. Zen in character, the sound of flowing water follows as one crosses arched bridges over coy ponds, runs ones fingers through the tall grass, gazes upon lilies and statuettes, and marvels at the beauty of the colorful flowers lining the pathway. As we gazed at the small fountain, an elderly gentleman approached, “So, where are you folks from?” He asked, simply wanting to make friendly conversation. “Texas.” He smiled, “I’m from here. I love coming here, meeting new people from all over…I come here every morning – it’s the most beautiful place in all of Solvang.” He gazed over the garden. It was evident that he truly appreciated the garden. “We’ve been coming back here for over half a decade and in the earlier years when we lived in California, sometimes three times a year.” He looked up over beyond the cottages, “I love how you can see the mountains in the background…” The mountains loom in the background, often with a morning cloud passing slightly below its zenith – locally known as sea smoke. We bid him good day and took our leave. This elderly gentleman is just a single anecdote of how wonderfully nice, polite, and kind everyone is in Solvang – they will even stop in the middle of the street to let a pedestrian cross. Cottage 5 is the largest of all the cottages with two spacious floors. It feels more like a home with a large kitchen, spacious living area with extended bay windows, private deck separated from the spa on the other side of the structure, high vaulted ceiling in the upstairs bedroom, and is at the back of the garden. As such, one must walk through the entire garden to arrive at the front door, adding to the experience. All cottages have ceiling fans in the living area and bedroom, as well as central air conditioning and heating which is very convenient from the traditional Californian wall mounted units common at other hotels. The interiors of the cottages (we’ve stayed in all but one) are full of charming character, setting them apart from neo-modernist versions of avant-gardist Scandinavian design so common in other local hotels. Using Scandinavian motifs, soft pastel painted walls and dark wood framing, the cottages feel as if they are right out of a fairy tale. Each has a warm gas fireplace with a mantel, small kitchen, and very large, open, vaulted ceilings in the living rooms and bedrooms. The bathrooms are very large with huge showers and most all cottages have private outdoor jetted spas. Very spacious in design, it is easy to forget that you’re not in a cottage in the Danish countryside. The view from within each cottage is breathtaking as every window looks directly upon the garden and from the second floor of some of the cottages are stunning views of the Santa Ynez mountains. Cottage 1 is closest to the fountain and is extremely comforting in nature. One must cross a wooded foot bridge over a coy pond to reach the front door which has a classic renaissance knocker. Warm and welcoming, it has perhaps one of the most beautiful bathrooms of all the cottages and has the most wooded motifs: wood flooring, wooded crown molding, wooded paneling in the living room, a wooded stairwell leading upstairs to the private bedroom and wood features throughout. The private jetted spa is just off the living room on a wooded deck and very secluded. Cottage 4 is a cottage suite consisting of a single floor (as is cottage 3 underneath it and cottage 6 across the garden). It has one of the most unique wrap around layouts and perhaps the largest bathroom of all the cottages. The bathroom counter and bedroom end-tables are made of natural marble. Despite being a single floor, it is the only cottage with an additional twin bed just outside the bedroom, presented as a chaise longue. High angled ceilings with large wooden beams throughout, both the bedroom and living room provide stunning views of the garden. Cottage 6 is located right next to cottage 5 at the back of the garden. It is also a cottage suite and a single floor however, it has perhaps the highest ceiling of all the cottages and has the most windows, thereby providing the most natural lighting. The cottage suites do not have outdoor jetted spas but they do all have fireplaces. With the largest dining room table of the cottages, we were able to host a dinner party after a day of winery visits. Room 303, a village suite, is on the top floor. With stunning views of the rooftops, it's location provides the most European impression and is very reminiscent of any rooftop vista in a northern European city. The interior photograph is not of room 303 but of another village suite, posted here to give the general impression of a village suite room. On a beautiful sunny day, taking one's breakfast up to the room's deck provides a very refreshing start to a wonderful day and having one last glass of wine as the sun sets concludes a perfect day! Solvang is danish for "sunny field." Dubbed, "More Danish than Denmark" this European enclave has a history that originates with Danes. With the dream and ambition to create a danish settlement on the west coast, three settlers purchased land and developed a folk school, Lutheran church, a general store and a college at the beginning of the 20th century. The village soon quickly grew as newspaper advertisements went out across the country to attract Danes: many came and settled the area from the Midwest and as far away as Denmark. The town exploded with the addition of a hotel, a creamery, a bakery, a bank, and a butcher shop. 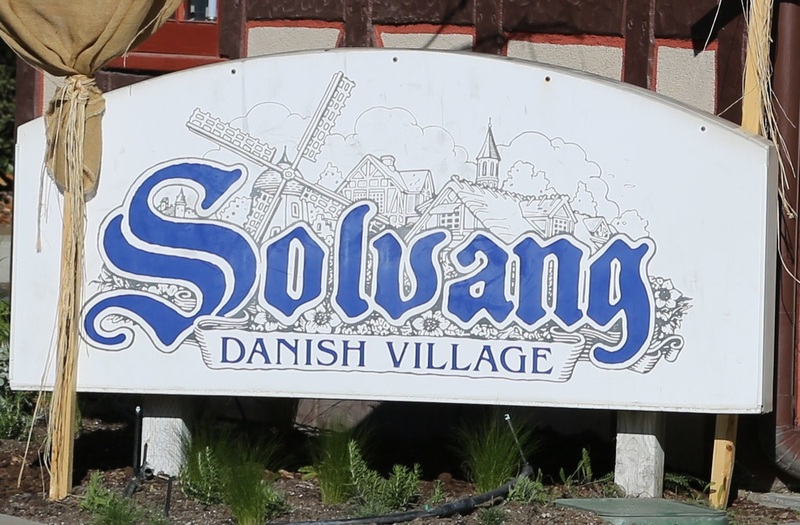 Danes began farming the local area and the village of Solvang was here to stay. Solvang's allure caught the attention of the Danish Royal Family, whose members have visited Solvang on three occasions (and very recently the Danish Ambassador to the United States for the city's centennial in 2011). Often with the fascination of royalty, this in turn caught the public's attention and Solvang quickly became a tourist destination. 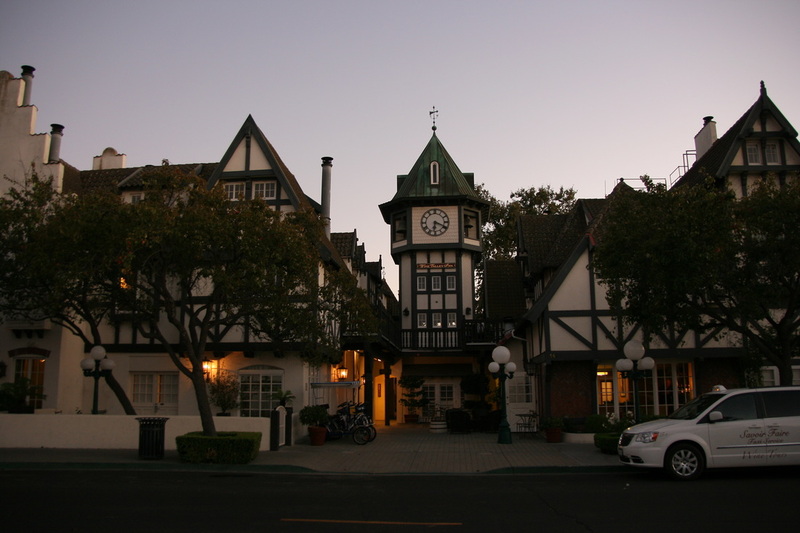 The academy award winning film Sideways also used Solvang as it's backdrop. Solvang has four large, enchanting Danish windmills built in the mid 1940's; each of which lends it's own unique charm to the village. During large festivals, it is common to see them turning but otherwise throughout the year they remain inert. Despite being surrounded by golden hued mountains or rich, plush Palm trees - sometimes on the very streets of Solvang - it is easy to feel as if one weren't in the United States at all but rather in Denmark with a little bit of childhood fantastical reminiscence. The only problem with fantastical reminiscence is that all of the buildings in Solvang are original and real! Largely built in the Danish Provincial style after World War II by Ferdinand Sorensen, a Nebraskan (who fell in love with Denmark after a trip there), the city achieved its goal of becoming an authentic Danish Village, something much wanted by locals for some time. Sorensen also designed and built the four windmills, which greatly add to the affection felt for the village by both locals and tourists alike. A short while thereafter in the '50's, a local architect, Earl Petersen, adapted other structures in a similar style. In Denmark, Storks are considered a symbol of good luck and provider of protection for the house under which they perch. For the Danes, the Stork is very much regarded with much of the same reverence that Americans feel for the Bald Eagle. The only problem is....the White Stork of Denmark is extinct in the wild. In Solvang, the love and affection for the White Stork is visible on the rooftops, where replicas abound. Hans Christian Anderson's Little Mermaid greets everyone at the village entrance. It is a replica of Edvard Erikson's sculpture of the Little Mermaid in Copenhagen, Denmark. Not to miss nearby is also the Hans Christian Andersen Museum. The streets are very easy to navigate and are always filled with people! However, should one want to repose after a few tasting rooms, Rita and Claire can pull you around town on the Honen guided trolley tour ("The Hen" for historical significance). A visit in October will allow a cornucopia of interesting displays and even more interesting people! Each year the city of Solvang puts on a fun contest with the merchants for who can have the most outrageous Halloween / Day of the Dead displays. The community embraces this and fully throws themselves into the festive spirit! If a visit occurs during non-festive moments, one is more than likely to discover an equal amount of interesting experiences and wares. From art galleries, antique shops, jewelery boutiques, clothing stores and art glass to Æbleskiver, Chocolatier shops, and wine tasting rooms...there is plenty to do and see while meandering the streets. Of particular note for fine delectables: Ingeborg's Chocolates, Solvang Restaurant's Æbleskiver, Paula's Pancake House for fantastic Danish pancakes and Danish sausage and Mortensen's Danish Bakery. The Mision sits elevated over a valley of vineyards with vistas of mountains and the surrounding areas. The stages of the cross allow guests to walk the various areas of the grounds with splendid views. To arrive at the interior courtyard, one must traverse the interior museum which is filled with very interesting stories of history, life at the mission and artifacts ranging from various garments worn to the actual tiles from various periods of the roof. The courtyard is filled with lush manicured gardens, water flowing fountains and and an abundance of verdant palm trees. A sense of calm consumes the soul and one finds themselves with such a sense of peace that lingering throughout the courtyard gardens for the entire day would not be out of the question. 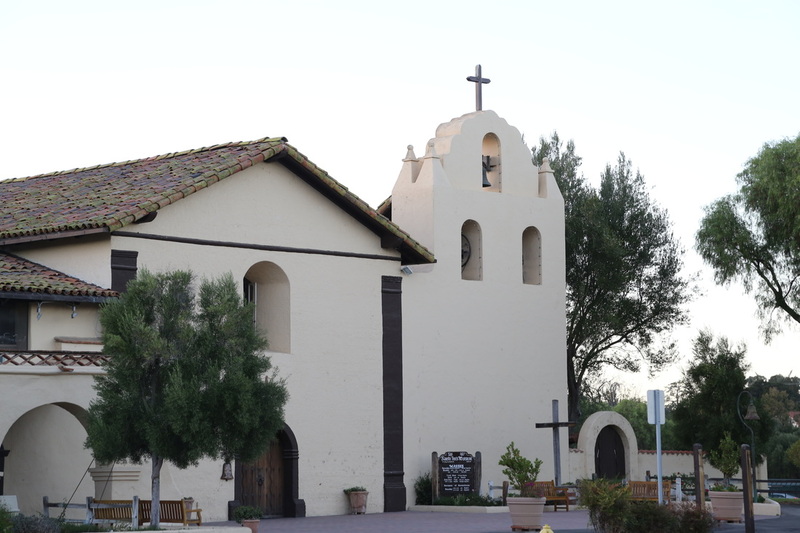 The structure of the mission is classic adobe, much of which is still original. As it is still an operational mission, monks can often be seen wondering the hallways.